This year’s Dreammaker of the Year Luncheon was filled with warm hearts and positive intentions. The honored Dreammaker of the year was Richard Gonzmart, a gentleman with a heart of gold and a legendary footprint on the community. Richard is the President of the esteemed Columbia Restaurant Group that serves Tampa Bay with their culture, customer service, and delicious food. Richard has supported the Children’s Dream Fund for years and is currently sponsoring cancer research to find a cure for Sarcoma, which has the second highest cancer mortality rate. Attendees were fortunate enough to meet Agata, who was gifted a “dream” by the Children’s Dream Fund. Agata shared the struggles she went through with her health and how those tribulations took over most of her high school years. Despite living in a hospital, she was determined to finish her schooling, and that’s exactly what she did! 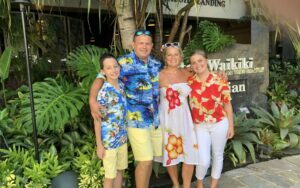 Agata’s dream was to go to Hawaii, and the Dream Fund was able to make her dream come true. Her trip was filled with activities she had always dreamt of, from swimming with dolphins to a helicopter ride over active volcanos! The smile that spread across her face while she shared her story with a room full of strangers was priceless. Attending the luncheon reminds all of us what an amazing foundation CDF is and why we continue to support them. WestCMR looks forward to what the future has in store for the Children’s Dream Fund and the once in a lifetime opportunities they continue to make happen!